It is certainly both incredible and inspiring to see how Black Metal has spread across the planet. It seems there are literally bands from every corner and crevice of Earth. SOL SISTERE is from Santiago, Chile, and they are a five-piece band who specialize in the crafting of Black Metal tinged with atmospheric leanings. “Extinguished Cold Light” is their second full-length and is due to be released on May 3, 2019 via the Dutch label, Hammerheart Records. “Elemental Chaos” is the lead track and it sets a proper precedent after it gets going. While one may sit back rather uninvolved initially, it is as the song develops that the band shows its penchant for crafting quality Black Metal. There is a traditional take on the genre; however, the guitars are deeply layered and the bass is at the foreground certainly making its presence known all the while. The following track, “Spiral Moon,” is immediately more engaging with its somber, forlorn-sounding melody as expressed through the guitar. Hearing the two players’ parts in harmony is like appreciating a multi-faceted piece of proper art. Without the other, as well as the bass, the song would come off as shallow. All the while, the drummer blasts away mercilessly portraying a feeling of eager anticipation, raw excitement. The song really opens up toward the latter half with one guitar playing some huge chords while the other conveys the melodic message before the two again converge on the original idea. Those who regard themselves as purists or lovers of more traditional Black Metal will certainly gravitate toward this release. It isn’t trying to incorporate any Jazz elements or Shoegaze a la MY BLOODY VALENTINE. While plenty of bands are out there trying to branch out and radicalize things, SOL SISTERE keeps it simple and safe. The attraction presented by the music is framed by contrasts. As the music marches furiously onward, one guitar will present a pensive, longing, emotional-sounding part. At other times, the vocalist is screaming at maximum, practically shredding his vocal chords in the process while the melody presented is wrapped in solitary beauty, shimmering like light reflected upon a prism in darkness. “The Faceless” is the fourth track and sees these aforementioned traits amplified. One cannot help but think of classic BURZUM during parts as the riffs have a haunting drone, resonating deeply within. The bridge features a gorgeously-presented melody performed by clean guitar. Wrapped in chorus and echoing continuously on and on, the clean part shows a different side to the band and could be likened to the clean parts used throughout IMMORTAL’s discography. 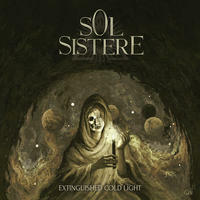 I cannot say SOL SISTERE is at that level of epic, but that is surely a similar effect. The bass, also touched by chorus, adds an alternate arpeggio complimenting the total scene created. When things get heavy again, the two guitars are layered and build a melody that sounds like weeping off each other. As the song wraps up, things come to a climax while the singer’s voice echoes loudly in the foreground. The fifth track, “Swallow the Misery,” is an increase in intensity. SOL SISTERE definitely have a pattern to their music and it works for them. Listening to the album, it is easy to imagine the band performing quite an intense live show. The U.S. would be lucky indeed to have them travel north for a trek across the country. In fact, they would pair well with a band like UADA or PILLORIAN. This album was an excellent find, rich in atmosphere, and made to be played in its entirety. The music really inspires creativity through its own expressionistic invention.